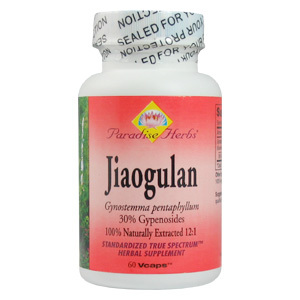 Jiaogulan is naturally extracted using only the finest quality Gynostemma pentaphyllum. Our Standardized True Spectrum extract provides active levels of gypenosides, concentrated in the balanced ratio nature intended, without isolating, fractionizing or using toxic solvents, harsh chemicals or gases. Jiaogulan, also called Southern Ginseng or Xiancao, meaning “immortality” or “the miracle herb”, is one of the most popular anti-aging tonics in Asia. It is a powerful adaptogen, antioxidant and rejuvenator and has many health promoting properties. It supports normal cholesterol levels, immune modulation, healthy metabolism and enhances overall longevity and well-being. 1-3 Vcaps daily or as directed by a qualified healthcare professional. WARNING: Keep in a cool dry place, out of the reach of children. This product is not intended to be used by pregnant or nursing women. Other Ingredients: Capsule (vegetable cellulose). 100% vegetarian. No fillers, binders or common allergens. Jiaogulan, also known as Gynostemma and Southern Ginseng, is a remarkable herb popularly believed to be a major anti-agin longevity tonic and a virtual "cure-all." The ultimate greatness of Jiaogulan lies in its broad spectrum adaptogenic quality. It has the ability to bring balance to the body under a wide range of stressful circumstances. The chemical constituents responsible for the adaptogenic characteristics of Jiaogulan are saponins called gypenosides. Jiaogulan contains more than eigthy different gypenosides, the broadest range of saponins in one plant in nature. 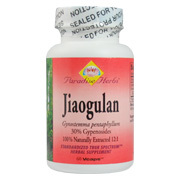 Studies indicate that Jiaogulan has a regulating, adaptogenic influence on the central nervous system. It is calming when one is overexcited and stimulating when one is depressed. It is an antioxidant, immune modulating, anti-inflammatory, anti-aging agent; it improves digestion, strengthens the mind, improves sexual functions, calms the nerves, eases the pain, adjusts blood sugar and reduces blood fat. As a diet herb, it helps b accelerating the body's metabolism. It will help reduce weight in overweight people, and can help athletes, bodybuilders or excessively slim people gain weight. It has been shown to lower LDL and increase HDL cholesterol and is effective in treating liver damage and hepatitis. Recent research has indicated that Jiaogulan has both anti-cancer activity and an immune protection/prophylactic agent for HIV infected individuals. The direct effects of gypenosides on cancer cells from carcinomas of human liver, lungs, skin and uterus was studied and the results showed that these saponsis inhibited the proliferation and growth of cancer cells. Studies also confirmed Jiaogulan increased the white blood cell count of patients receiving chemotherapy and radiation, improving their ability to recover. Jiaogulan - is shipped in a discrete, unmarked package. Orders are processed immediately and usually take about 3 to 5 working days to be received. We do ask that you try it for 2 to 3 weeks to feel the full effects. Any information received is used only for order processing and shipping purposes. Your information, such as e-mail address, will never be disclosed to a third party.